Since an old memory disappears when updated at those who use a previous version, please be sure to take the duplicate of data. All people have the infinite capability to fulfill hope. By deciding a big target and challenging, the realization is attained. This application supports that you spend valuable days by having big targets. 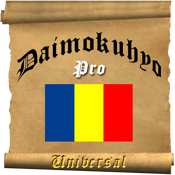 - "Daimokuhyo_pro_uni" application is universal specifications of "Daimokuhyo_pro" application. This application supports 9 languages. - You can set it at "a long period, a period of the middle, a short period" for the achievement of a target. Or you can set the targets of three different genres. - This application has a simple interface and the adventure-like contract, you can put up motivation very much. Furthermore, "The kanji - calligraphy" becomes the boom in Europe and America, and you can realize a progress degree to accomplishment visually. Please tap a certain "en" and displayed language choice button first right under title -Daimokuhyo. 9 languages of en( English), fr( French), de( German), it( Italian), sp( Spanish), pt( Portuguese), kor( Korean), cn( Chinese) and jp( Japanese) become the scroll bar list indication belonging to it (a default is en). After having finished application when you choose it once, setting is stored. Other operation methods follow "Daimokuhyo_pro" application.